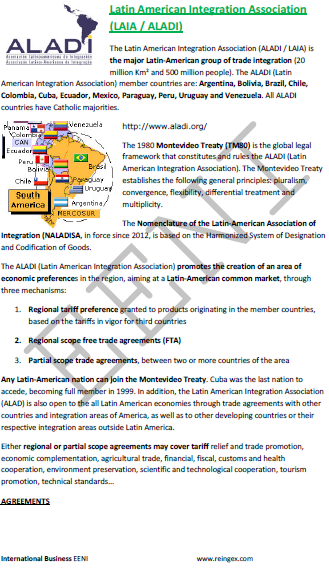 Syllabus of the Subject - Latin American Integration Association (ALADI/LAIA). The member countries of the LAIA are Argentina, Bolivia, Brazil, Chile, Colombia, Cuba, Ecuador, Mexico, Paraguay, Peru, Uruguay, and Venezuela. 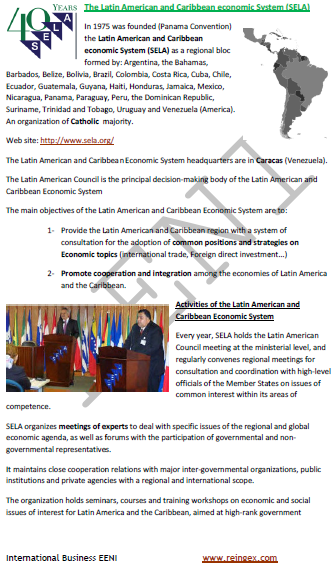 Syllabus of the Subject - Latin American and Caribbean Economic System (SELA). The member countries of the SELA are Argentina, the Bahamas, Barbados, Belize, Bolivia, Brazil, Colombia, Costa Rica, Cuba, Chile, Ecuador, El Salvador, Grenada, Guatemala, Guyana, Haiti, Honduras, Jamaica, Mexico, Nicaragua, Panama, Paraguay, Peru, the Dominican Republic, Suriname, Trinidad and Tobago, Uruguay, and Venezuela. 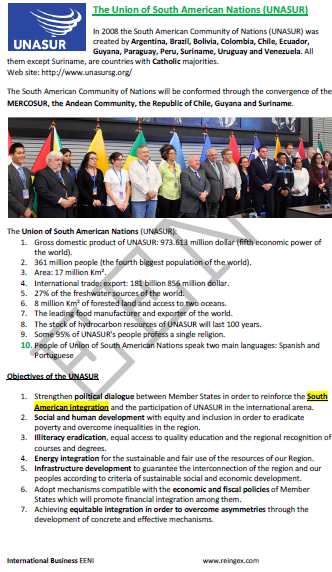 The member countries of the UNASUR are Argentina, Brazil, Bolivia, Colombia, Chile, Ecuador, Guyana, Paraguay, Peru, Suriname, Uruguay, and Venezuela. 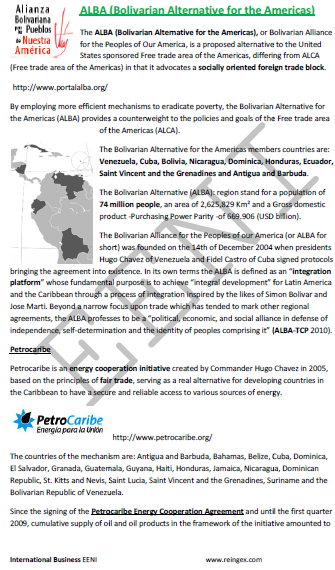 Syllabus of the Subject - Bolivarian Alliance for the Peoples of Our America (ALBA). The member countries of the ALBA are Venezuela, Cuba, Bolivia, Nicaragua, Dominica, Honduras, Ecuador, Saint Vincent and the Grenadines and Antigua and Barbuda.